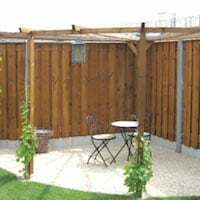 Category – Gazebo and Timber Structures. Here you will find advice as well as customer reviews that are dedicated to our range of gazebos here at Tuin. 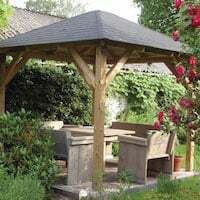 Our advice posts comes with detailed instructions on what will be the most suitable way of installing your gazebo, paired with images of each major step to further guide you if you are unsure on how to install your gazebo. 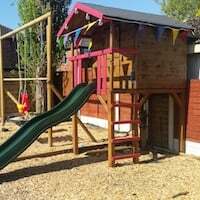 Due to the way the Larch Garden Building kits are sent out, we tend to advise that experienced DIYers or carpenters/builders should tackle the challenge. These are a ‘proper building’ as we describe them. 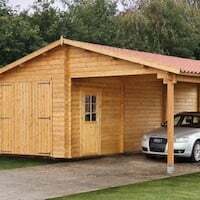 They are a timber structure which can be adjusted and modified to suit your requirements, various modules in larch timber can be added to them such as extensions, walls, framing etc. A recent customer sent in this picture set of the Larch Pent Garden Building Seven, this is the basic structure and to this walls, doors, windows etc can be added in a variety of materials to create open barns, carport, summerhouses, offices, in fact any structure your require. 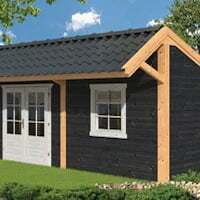 The Larch Building Structures are a VERY economical alternative to the traditional oak garden building. It is recommended, as with all timber that you pilot drill your screw holes with a durable, trustworthy power drill. Once your main frame/body is installed, the next step would be installing and securing the roof purlins, again ensuring that everything beforehand has remained to the required level for the desired pent roof. 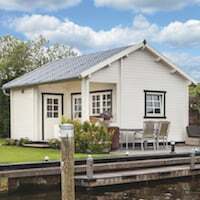 If the purlins are nice and level then installing the roof boards should be simple, given that their tongue and groove design allows you to simply slide them together and nail them to secure them. 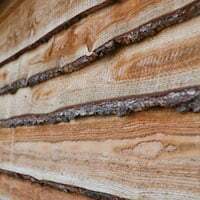 Please note that the use of steel nails is not really recommended for larch as in oak. Then to finish off the building the customer used EPDM roofing material to cover the roof boards. EPDM is ideal for flat or low pitched roofs due to its durable rubberised material which lasts for years and years. The EPDM is finished off with a metal roof edging trim. Thank you to the customer who sent these in! They are truly stunning and we hope that you’ll enjoy the Larch Pent Building Seven for many years to come! It is not often we get a detailed review on one of our gazebos and the review below is very much appreciated. 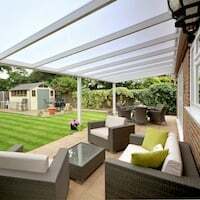 This is our customers account of the Superior Gazebo, some is good, some not so but it’s a good story and worth a read of Mr P-K’s story, it also helps us greatly. I have put together this account of my experience in building my gazebo, which I am very pleased with. I wondered if it would be of any interest to you to put on your website for other potential customers to read. I have attempted to include several pictures of the build, though some or all of these may not arrive due to my very limited proficiency at the computer. After a delivery that proved slightly problematic (the carrier refused to even attempt my narrow lane and off-loaded three-quarters of a mile from my house, which meant 4 trips up the lane with my trailer to transfer it all here) I laid everything out as advised by Richard’s excellent blog. 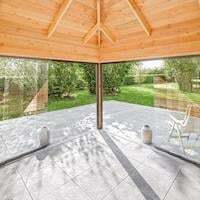 I was impressed by the obviously generous coating of Tanalising material present and also by the general straightness and solidity of the timber. I was less impressed with the post holders that I had ordered as an extra. These were not only a poor fit – 120mm square for down posts that measured 112mm square, but also quite thin at 2mm and only tack welded. I voiced my doubts to Tuin who immediately arranged their collection and refund with no deductions for carriage. As I knew I would be unable to start the construction for at least 4 weeks, I stacked everything under cover in the way suggested by Richard in his blog. On my return from holiday I started the construction by laying out the Ring Beam to determine the position of the post holders. These were made specially for me by the ever helpful Weldspray Engineering at Liskeard. 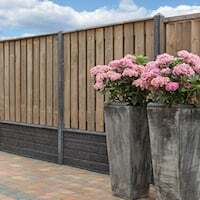 They worked out a bit more expensive than those supplied by Tuin, but were a good fit (115mm square), fully seam welded and constructed of 3mm steel (galvanised). Taking advice from the blog, I spent a lot of time doing this in order to achieve a perfect rectangle. I happened to have a large builders square (a 3ft/4ft/5ft Triangle) available and this proved invaluable in keeping the corners at 90 degrees. (You can see this leaning against the rear wall in some of my photos). After the best part of a day (mostly spent drilling 24 holes into the hardest concrete I have ever encountered) I was happy with the positioning and solidity of the post holders, each being held down by four 10mm rawlbolts. Diagonals were measured and found to be within 2mm of each other, which I though was pretty good! Putting up the 6 posts was child’s-play. My post holders easily held the posts upright while I attached the six pieces that formed the ring beam and the twelve bracing struts. Again, I made good use of my 3-4-5 triangle to ensure everything was true and square, sometimes clamping this triangle in place before screwing in the braces. So far I had carried out all the work single handed, but for the next bit, fitting the corner rafters, king pins and ridge beam I needed the help of my wife as I could not have held the ridge beam in place on my own while I fixed the rafters in position. Once this was done I reverted to working on my own again, fixing the roof boarding in place. At this point I was glad I had spent so much time getting the basic frame square, as the roof boards required minimum cutting. I differed from Richard’s recommended procedure here. Because of the site I had chosen for my gazebo, setting up trestles outside the structure was difficult – though I did manage to do so later on in the build – so I set up my trestles inside the building and worked from the eaves upwards and the ridge downwards for as long as there was room for me to get my body between the two areas of boarding. This left me with a narrow strip in the middle to fill in, which I did using one of the many extra boards supplied by Tuin, working off a ladder. For me, this was the most difficult bit! Indeed, to be honest if it had not been for the encouragement and physical help provided by my very able wife, I might have given up and called in professional help. Obviously I could no longer work from within the building, so I had to put up my trestles and boards outside as well as I could. Neither myself nor my wife are very keen on heights, which didn’t help. (neither did managing to fall off a ladder at one point, definitely not recommended for one in their late sixties). Nevertheless, we managed to rig up a tolerably safe system and set to fastening the waterproof membrane in place. I used an electric staple gun for this, which by and large worked quite well, except for hitting the occasional knot, which resisted the staple. Finally, we started the tiling, which proved a slow and tedious business. The first few rows were easy enough as I could fix them from the comparative safety of the scaffold boards alongside, but as I got towards the ridge I obviously had to work off a roof ladder with my wife passing up the tiles, nails etc to me as I went. At this point I experience my first slight disappointment in the design of the gazebo. Because there are only 12 rafters in total, the span is sometimes as much as 4 feet, which is just too much for nailing into such thin (15mm) roof boards. Bounce is inevitable, making it very difficult to accurately nail the galvanised clouts that hold the tiles in place. It took us almost a week to complete the tiling, though we were not working full days on it, a few hours at a time was enough! I was fairly liberal with the tile adhesive as I knew there would not be much warm sun about in October to melt the glue strip on the back of the tiles. I was unsure as to how exactly to finish the ridge line and the hips, but a call to the very helpful advice line provided by Tuin soon sorted us out. At times the task did seem a bit daunting, but providing you have ay least a modicum of DIY skill and a healthy dose of common sense there is nothing really too difficult here. The whole thing took us just over three weeks to complete, but most days we only worked 4 or 5 hours, regularly knocking off for a visit to the gym or one of our Pilates lessons (Yes, they really do work, I’m sure I couldn’t have done this if I was not already reasonably fit!) A week after completion I celebrated my 70th birthday, which gave be a considerable sense of satisfaction. As you can see from the picture, my Gazebo is intended as a car port and I am already contemplating partially filling in the end and the sides. The extra roof boards supplied by Tuin (I had 12 left over) will make a good start for this! Custom made post holders as the ones supplied were not suitable. Superior gazebo roof boards being fitted. A good use of trestles and ladders to install the gazebo roof. The install is very impressive and especially applauded due to its height and age of installer, even I struggle these days so perhaps I should take up Pilates like Mr P-K. Thank you Mr P-K for sending us this report, it is so helpful for us and other customers, we hope you enjoy the present we sent you, thank you again. A taste of the Mediterranean with our Greek pergola roof component system. A complete kit is offered as well as the separate parts to create your own. This Greek Pergola Roof carries the FSC logo indicating that any wood used is sourced from responsibly managed forests. 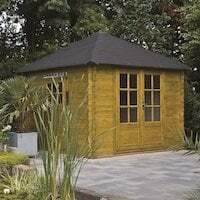 Combine with the optional Greek roof support structure to create a focal point within your garden. Lattice roof sections are 35cm x 35cm. 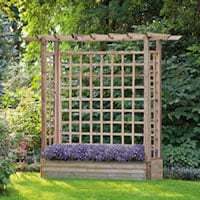 22 notched supports interlock to create the lattice effect, each piece of wood measures 2.2cm x 9.5cm x 420cm. Another sunny Saturday. The leaves are slowly turning and there’s a lovely breeze, a little fresh but a glorious start to the day.